Right now we are waiting for new John Knapp Fisher Limited Edition Prints to arrive at the gallery. In the meantime, here is a selection of the artist's archived art work which has featured at Red Rag Art Gallery. If you wish to register to receive updates and alerts when new art work from John Knapp Fisher arrives select this link. John Knapp-Fisher was born in London in 1931 and died in 2015. His early years were spent in the Kent countryside. His father Arthur Bedford Knapp-Fisher was Professor of Architecture at the Royal College of Art. He was a lifelong draughtsman and watercolourist, and John's earliest memories are drawing and painting alongside his father. John Knapp Fisher studied graphic design at Maidstone College of Art. In 1965 John Knapp-Fisher moved to West Wales. Since then he has become one of the foremost landscape Welsh artists with a worldwide following of art lovers. 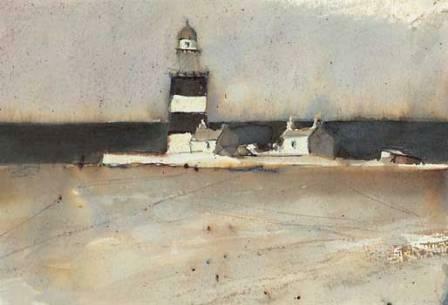 John Knapp Fisher produces paintings in water-colour, ink, and oil. His paintings and limited edition prints typically capture the majesty and ruggedness of the Pembrokeshire coastal area. The quintessential John Knapp-Fisher painting or limited edition prnt is a Pembrokeshire cottage, farm, or church appearing luminously against a dark landscape, but it is the quality of light in his art works which is so apparent and recognisable. All John Knapp-Fisher limited edition prints from Red Rag Art Gallery have been reviewed by the artist. This guarantees that all prints offered by Red Rag satisfy the high quality and fine art standards set by John Knapp-Fisher for art prints. Each limited edition print series from the Red Rag British Art Gallery is available for immediate delivery and can be shipped worldwide.